Cadence Tubular Bandana 25 ( l ) x 50 ( w ) 100% polyester This is an extremely versatile multi-purpose garment, manufactured from soft and stretchy polyester. It is wind resistant, breathable, wicks perspiration and is quick drying. The Cadence Tubular Bandana can be worn as either casual wear or in the outdoors where it offers protection from sun, wind, dust and insects in summer and keeps the neck and head warm in winter. 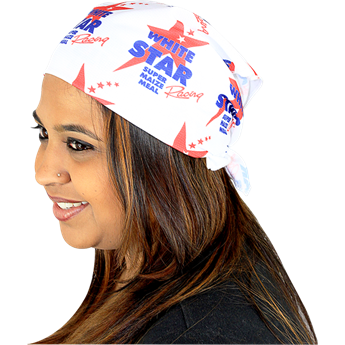 It can be worn as a head band, beanie, pirate style cap, foulard, helmet liner, neck gaiter, balaclava, dust screen, scarf, hair band, scrunchie, bandana or wrist band. This item is machine washable, doesn't need ironing and is one size fits all.